You don’t have to gamble on Port Gamble wedding photography. 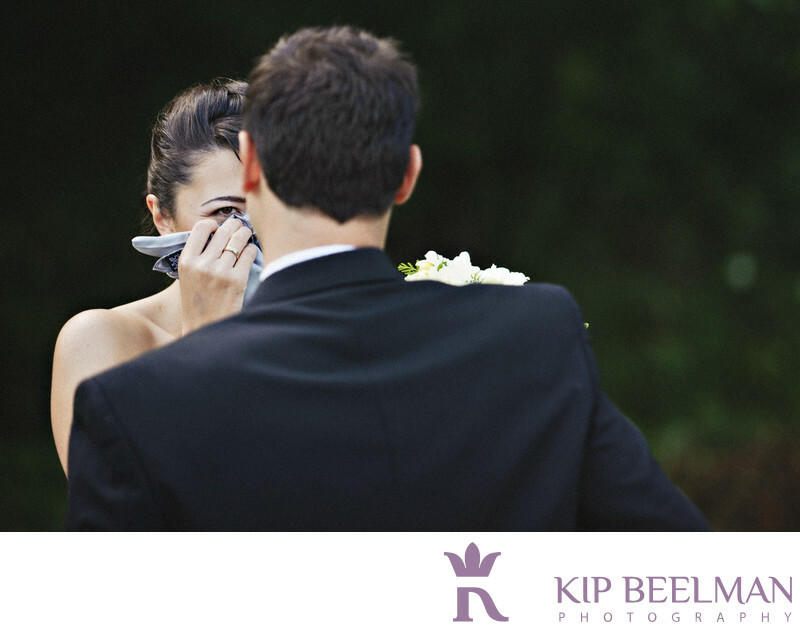 Suffused with natural beauty and natural light, this award-winning image from Fearless Photographers shares the bride’s delight and emotion when seeing her groom for the first time on their wedding day in Port Gamble, Washington. His expression is equally priceless. A fantastic wedding location, Port Gamble is known for its lovely waterfront, breathtaking venues and year-round focus on celebration. A waterfront jewel of the Kitsap Peninsula that is located on the shores of the scenic Hood Canal, this picture-perfect city was once the longest continuously operating mill town in North America. Today, it is a wedding photographer’s and wedding planner’s dream. The couple got ready at the beach-themed Port Gamble Guest Houses and held their wedding ceremony in a charming chapel that was awash in gorgeous light glinting on the robin’s egg blue walls. The newlyweds celebrated with a kiss and by ringing the chapel bell before entering the receiving line. The couple’s wedding photo walk included the quaint Port Gamble General Store and Café as well as beautiful outdoor portraits of the bride and groom along with their family and wedding party. The gorgeous reception took place at the Hood Canal Vista Pavilion, which is set on a bluff with perfect views of the Hood Canal and Admiralty Inlet. A whopping 31 windows let in abundant natural lighting, in contrast with the glow of the stone floor to ceiling fireplace. It was all aces for this Port Gamble wedding photograph. Location: NE Walker St, Port Gamble, Washington 98370. Keywords: Church Wedding (21), Hood Canal Wedding (3), Port Gamble (3).